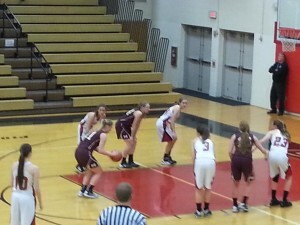 Madison Koehler at the foul line during Monday’s contest. In a non-league battle of possible contenders, the Lady Mustangs of Governor Mifflin traveled to Boyertown to square off with the Lady Bears. Both teams entered the contest in second place of their respective leagues. The Lady Mustangs came in with an 8-4 overall record, while the Lady Bears came into play with an 8-2 mark. Boyertown jumped out to an early 17-7 lead after the first quarter, led in large part by the stellar play of freshman forward Abby Kapp and senior guard Marie Valenti. The Mifflin girls would come roaring back though in the second quarter. Sophomore Madison Koehler outscored the entire Boyertown team by a score of 13-12 in the second quarter, cutting the halftime lead to six, 29-23. The third quarter would belong almost entirely to the Lady Bears, who outscored the visiting team 21-10 in the frame. When it was all said and done, the Lady Bears emerged victorious behind a final score of 66-45. Abby Kapp led the Boyertown girls with a career-high 22 points and 10 rebounds, while Madison Koehler led the Lady Mustangs with 26 points. The Lady Bears, who are now 9-2, will next travel to Pottstown on Tuesday in a Pac-10 contest. The Lady Mustangs, who fell to 8-5, will face Muhlenberg at home on Tuesday in a Berks I battle.